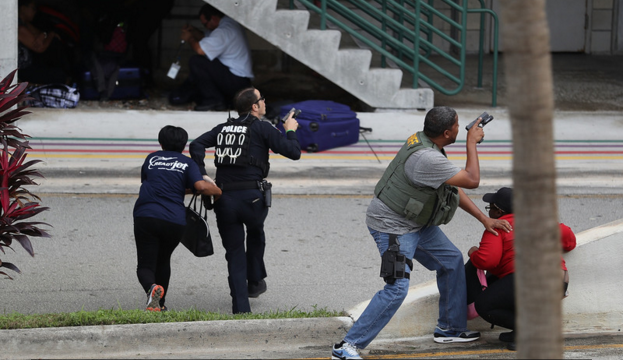 FORT LAUDERDALE: 26-year-old Esteban Santiago opened fire at Fort Lauderdale International Airport Friday afternoon, killing 5 and injuring 8. Photo: Getty Images. FORT LAUDERDALE, Fla. (FNN NEWS) — A gunman opened fire in Fort Lauderdale International Airport’s baggage claim area Friday afternoon. At present, there are five confirmed dead and eight injured. The gunman, who was carrying military ID, has been arrested and publicly identified by U.S. Senator of Florida Bill Nelson as 26-year-old Esteban Santiago. According to eyewitnesses, he was wearing a Star Wars t-shirt and the attack was unprovoked. Witnesses say he said nothing before opening fire. The eight injured victims have been transferred to a nearby hospital. Broward County Commissioner Chip LaMarca explained that Santiago was a passenger and had the gun in his checked luggage, which he retrieved and took out when he went into the restroom. Santiago was reportedly arrived on a flight from Anchorage, Alaska. Santiago served in the Puerto Rico National Guard. Broward Sheriff’s Office urges anyone with any information about the shooting to call 954-831-4000 or 311 instead of 911. Associated Press reports that the gunman’s brother noted Santiago has previously received psychological treatment in Alaska. Stay tuned to www.FloridaNationalNews.com for more updates.